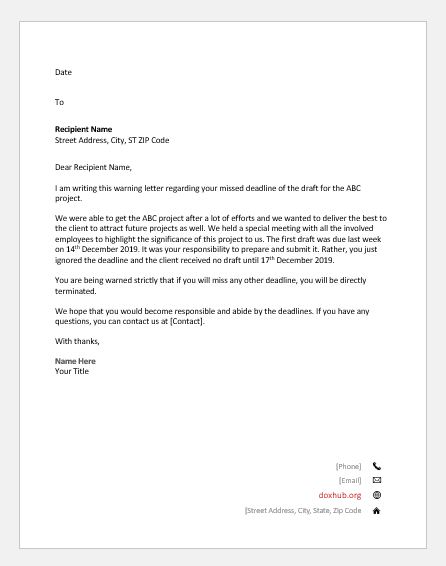 I am writing this warning letter regarding your missed deadline of the draft for the ABC project. We were able to get the ABC project after a lot of efforts and we wanted to deliver the best to the client to attract future projects as well. We held a special meeting with all the involved employees to highlight the significance of this project to us. The first draft was due last week on 14th December 2019. It was your responsibility to prepare and submit it. Rather, you just ignored the deadline and the client received no draft until 17th December 2019. You are being warned strictly that if you will miss any other deadline, you will be directly terminated. We hope that you would become responsible and abide by the deadlines. If you have any questions, you can contact us at [Contact]. This warning letter is being issued to you for your failure in terms of being forthright. 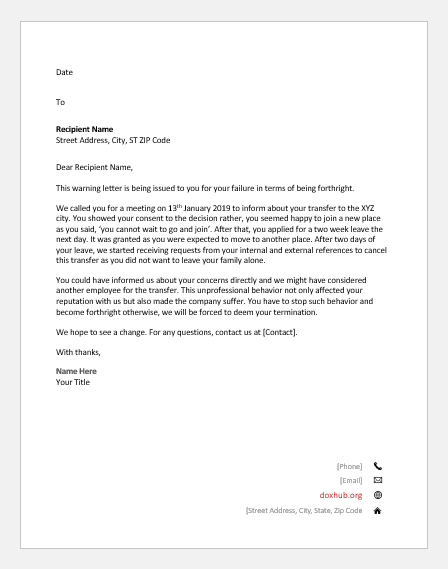 We called you for a meeting on 13th January 2019 to inform about your transfer to the XYZ city. You showed your consent to the decision rather, you seemed happy to join a new place as you said, ‘you cannot wait to go and join’. After that, you applied for a two week leave the next day. It was granted as you were expected to move to another place. After two days of your leave, we started receiving requests from your internal and external references to cancel this transfer as you did not want to leave your family alone. You could have informed us about your concerns directly and we might have considered another employee for the transfer. This unprofessional behavior not only affected your reputation with us but also made the company suffer. You have to stop such behavior and become forthright otherwise, we will be forced to deem your termination. We hope to see a change. For any questions, contact us at [Contact]. 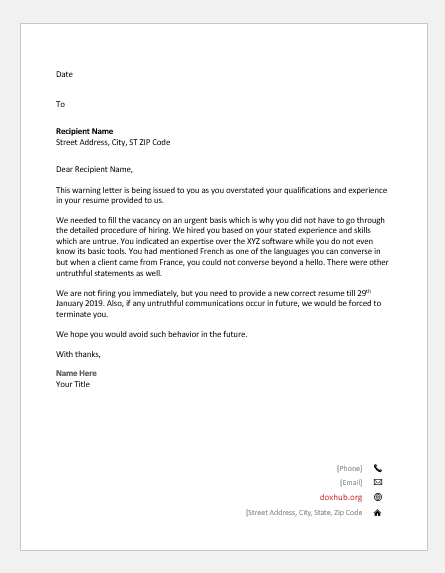 I am writing this warning letter regarding your withholding of the requested information. 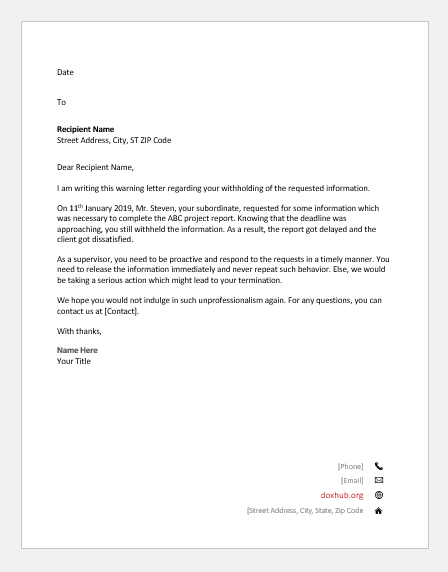 On 11th January, 2019, Mr. Steven, your subordinate, requested for some information which was necessary to complete the ABC project report. Knowing that the deadline was approaching, you still withheld the information. As a result, the report got delayed and the client got dissatisfied. As a supervisor, you need to be proactive and respond to the requests in a timely manner. You need to release the information immediately and never repeat such behavior. Else, we would be taking a serious action which might lead to your termination. We hope you would not indulge in such unprofessionalism again. For any questions, you can contact us at [Contact]. I am writing this letter to warn you about respecting the privacy of information. An office survey was conducted in December 2019. The results included personal information and opinions of the employees which is why that needed to be unshared. The information was with you and without any consideration, you just placed the file on the office portal which is accessible to all. 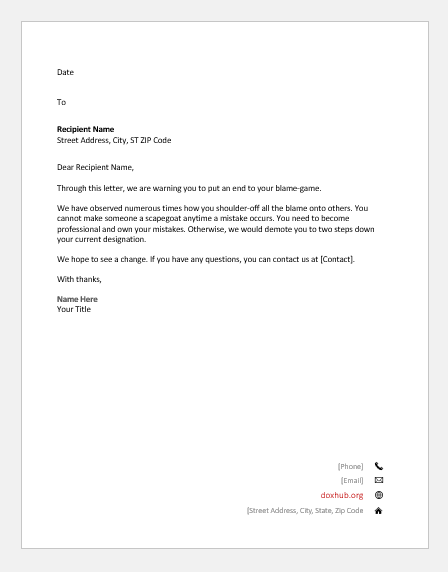 After we found out, we immediately removed it which is why you are only receiving a warning letter and not a termination letter. 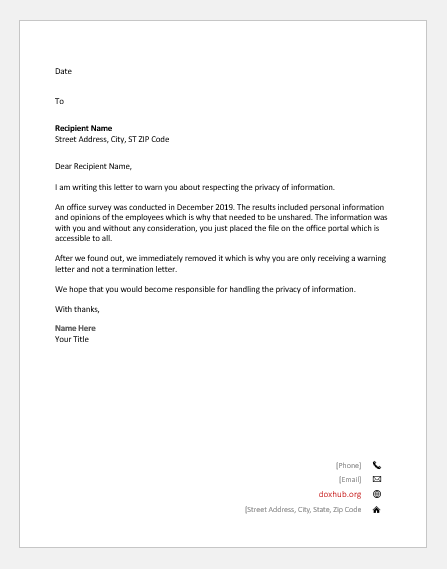 We hope that you would become responsible for handling the privacy of information. 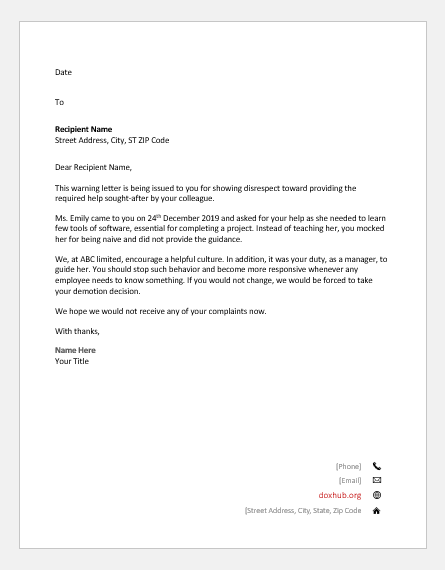 This warning letter is being issued to you for showing disrespect toward providing the required help sought-after by your colleague. Ms. Emily came to you on 24th December 2019 and asked for your help as she needed to learn few tools of software, essential for completing a project. Instead of teaching her, you mocked her for being naive and did not provide the guidance. We, at ABC limited, encourage a helpful culture. In addition, it was your duty, as a manager, to guide her. You should stop such behavior and become more responsive whenever any employee needs to know something. If you would not change, we would be forced to take your demotion decision. We hope we would not receive any of your complaints now. 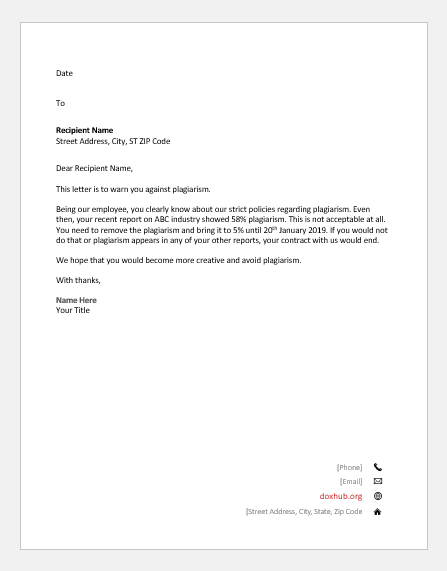 This letter is to warn you against plagiarism. Being our employee, you clearly know about our strict policies regarding plagiarism. Even then, your recent report on ABC industry showed 58% plagiarism. This is not acceptable at all. You need to remove the plagiarism and bring it to 5% until 20th January 2019. If you would not do that or plagiarism appears in any of your other reports, your contract with us would end. We hope that you would become more creative and avoid plagiarism. Through this letter, we are warning you to put an end to your blame-game. We have observed numerous times how you shoulder-off all the blame onto others. You cannot make someone a scapegoat anytime a mistake occurs. You need to become professional and own your mistakes. Otherwise, we would demote you to two steps down your current designation. We hope to see a change. If you have any questions, you can contact us at [Contact]. This warning letter is being issued to you as you overstated your qualifications and experience in your resume provided to us. We needed to fill the vacancy on an urgent basis which is why you did not have to go through the detailed procedure of hiring. We hired you based on your stated experience and skills which are untrue. You indicated an expertise over the XYZ software while you do not even know its basic tools. You had mentioned French as one of the languages you can converse in but when a client came from France, you could not converse beyond a hello. There were other untruthful statements as well. We are not firing you immediately but you need to provide a new correct resume till 29th January, 2019. Also, if any untruthful communications occur in future, we would be forced to terminate you. We hope you would avoid such behavior in the future. I am writing this letter to warn you about improving your appearance. You work in the sales department and that too, at the front-end which means a constant interaction with the customers. We have observed, even few customers have complained as well, that you come to work with your untidy look, improper clothing and untidy hair. This gives a bad impression of our company and pushes the customers away. You need to appear groomed and set for the type of work you do. Otherwise, you will be replaced with a person who have a good appearance. 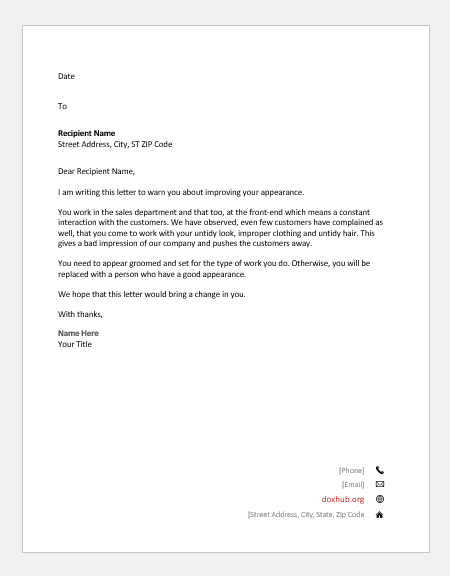 We hope that this letter would bring a change in you.